For those of you who don't know, I have a weird fascination with historical serial killers. And by "historical" I mean ones who acted before my time. Back when my husband was in college, he studied Anthropology with a minor in Criminal Justice, and there was one specific course that studied the different types of crimes in depth. They spent a lot of time studying serial killers (their different classifications, their patterns, their thought processes, etc. ), and my husband asked me to help quiz him for his quizzes. Combine all this new info to my always lurking interest and here I am now, lol. My husband likes to point out that serial killers are often interested in other serial killers. Not sure what he's implying there ... I guess I really do knit so I don't kill people - HA! 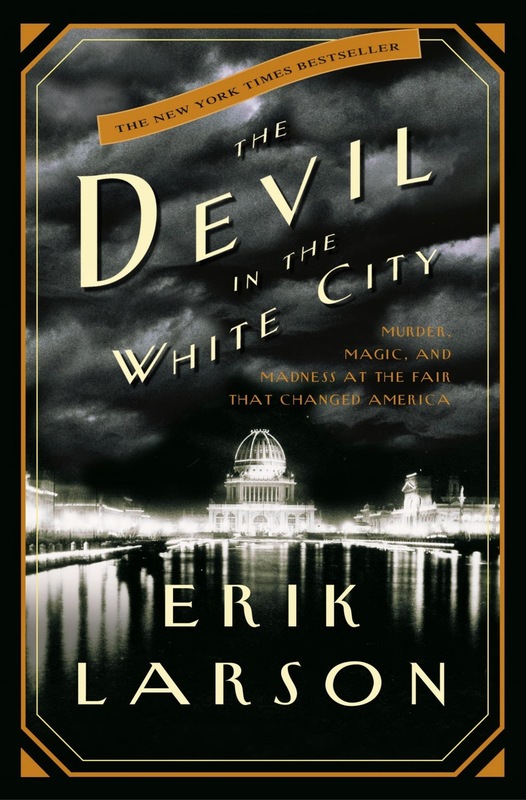 If you haven't guessed yet, The Devil in the White City by Erik Larson is about a serial killer. America's first ever documented serial killer to be exact. The book is a factual account of the 1893 World's Columbian Fair told alongside the killings that coincided with the fair by H. H. Holmes. At the same time the incredibly impressive fair was being designed and built, H.H. Holmes built a strange hotel that was his own design that aided in his killings. It is still unknown how many people he killed. Without doubt he killed at least 9, but when he wrote a confession he claimed he had killed 29 (though some of those people were not actually dead - his confessions were notoriously false). It is estimated that he could have killed as many as 200 people. I found this book subject very interesting, but the book itself was so slow. It is obviously written using old letters and documents from the 1890s, which admittedly must be a very difficult task for the writer to give a factual account, but it ended up that there was absolute detail overload on things you really don't care about (like what the full menu was at the meeting amongst the world fair designers - ugh! ), and the things you really do want to know are quickly glazed through or entirely speculative. The book spent an inordinate amount of time talking about all the fair specifications and the difficulties in building it, which are interesting but not nearly interesting enough to warrant the amount of time it took to read them. I was honestly so bored that I almost quit halfway through, but had higher hopes of what was to come when the killings actually started (as terrible as that sounds). Overall it was interesting, but only once I trudged through the first half. I give this book 3 out of 5 stars.